You are going to Watch Naruto Shippuden Episode 348 English subbed online free episodes with HQ / high quality. Stream Anime Naruto Shippuden Episode 348 Online English sub The New Akatsuki. Yahiko and Nagato attend a meeting with the Rain’s leader, Hanzō. Other members of Akatsuki discover that Leaf’s ANBU shinobi are also meeting with Hanzō, and suspect a possible betrayal. They attempt to catch up with Yahiko and Nagato, only to die at the hands of Zetsu and Obito who wanted Nagato to witness tragic reality just like Obito had when he’d witnessed Rin die at Kakashi’s hand. Leaf’s Root Division and their leader Danzō are revealed to have plotted with Hanzō to end the Akatsuki’s rebellion, capturing Konan and giving Nagato an ultimatum: kill Yahiko or they will kill Konan. 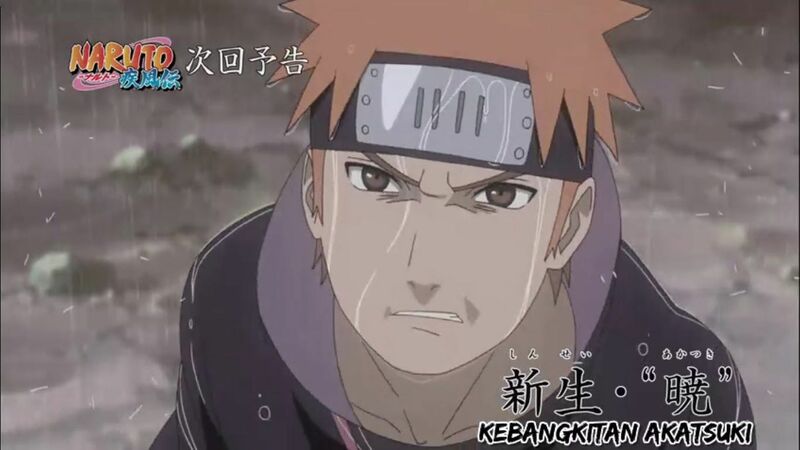 Choosing for him, Yahiko runs himself into Nagato’s kunai, killing himself, leaving Nagato and Konan devastated. Enraged, Nagato uses his Rinnegan to slaughter the Leaf and Rain shinobi by summoning the Gedo Statue, although Hanzō manages to escape. After this turn of events, Nagato finally turns to Obito, who witnessed the entire meeting. The final scene shows Nagato looking at Yahiko, whose body is now the Deva Path of his Six Paths of Pain, and saying that Yahiko will always be the true leader of the Akatsuki.